Inspired by the historical narrative of the founding of theJewish Ghetto in 1516, GER/The Stranger examines the complex duality created by the perception of “the other,” exploring the symbiotic relationship inherent in humanity, and the promise of intercultural compassion. 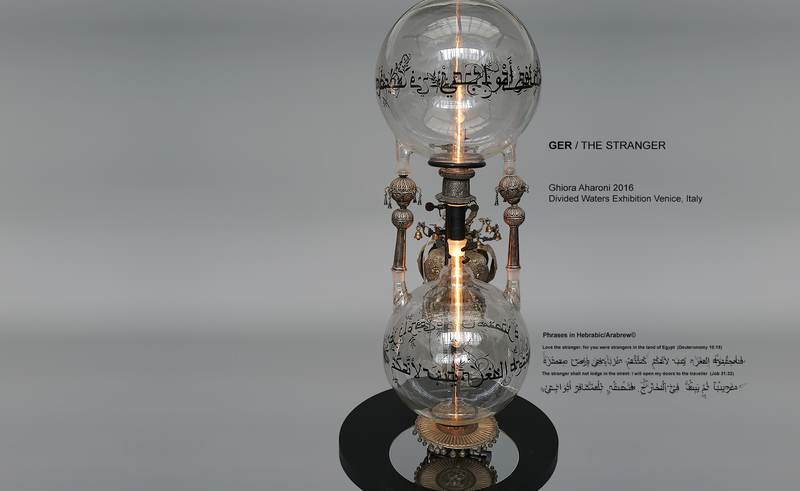 Reconstructing threads of the Venetian narrative via assemblage, Jewish and Christian religious iconography and two nearly identical glass spheres—separate, yet conjoined by vintage Torah finials—evoke a parallel, metaphorical existence created by the segregation of the Jews in Venice. The sculpture’s totemic, hourglass shape conveys a sense of time, of that which endlessly turns and repeats, recognizing that the Venetian Ghetto’s creation of the other is a narrative both older and more recent than the events of 1516: it is the timeless and enduring struggle of humanity’s relationship with otherness. While the phrases may conjure the Jewish and Muslim refugees of the 1492 inquisition, they also serve as a reminder that though these two cultures have become disparate in our contemporary existence, their two languages share a common origin—and in the recognition of oneness, the possibility of a parallel narrative exists where dualities can be unified.